Paper Pumpkin - I'll Share the Love with You! | Midnight Crafting Midnight Crafting: Paper Pumpkin - I'll Share the Love with You! Sign Up by 2/10 - and I'll add more to this sweet offer! New Paper Pumpkin subscribers who sign up at https://mypaperpumpkin.com/?demoid=2110890 by February 10, 2014, (thats TOMORROW, people!) will receive a FREE set of 2012-2014 In Color Stampin' Write Markers -a $14.95 value-with their Welcome Kit. But Wait - THERES MORE!! Does $100 in paper crafting products for $20 sound like a good deal to you? It is! Paper Pumpkin offers just this deal with new sign ups completed by February 10th. It is a monthly creativity escape delivered right to your door and includes everything to make the sample projects except adhesives. Cost is $20 plus tax. People like college students, kids of all ages and retirees would all love to get a fun creative box each month. So how do you get $100 for $20? Sign up by February 10th and help me earn a grab bag of $500 in retired products which I am happy to share with everyone that signs up! I need three more sign ups before I meet the goal to earn the grab bag. In addition, a free marker set will be included in the first kit which has a value of $15. So you are assured of receiving $35 of products for $20 at a minimum! https://mypaperpumpkin.com/?demoid=2110890 You can manage your subscription at this website also. So skip it for a month or two while you vacation in warm places or cancel it after the first month. But I am hoping you hang in for few months before deciding on cancelling because the next few months' kits are pretty awesome! Think of Paper Pumpkin as Happy Mail. It's a mini creative get away with all the prep work done for you. Each month a new project will be mailed to you. Everything you need to complete the project will be included in the box - all the supplies are cut, prepped, READY to create the project of the month! Instructions are included, so you can create whenever you want to! OR Join me at my Pumpkin Night event the last Tuesday of the month, and we will work on the project together! •This special offer is only valid for new subscribers. •The markers will be sent with the subscriber's Welcome Kit. No coupon code is required. 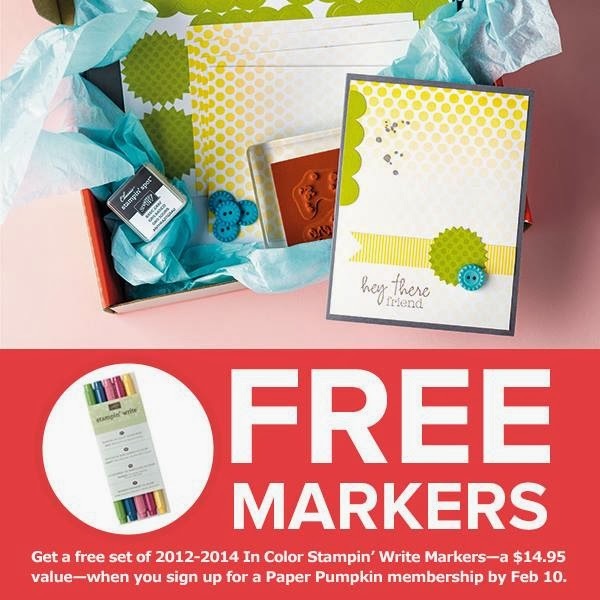 Anyone who signs up for a Paper Pumpkin membership during the promotion dates will get a set of 2012-2014 In Color Stampin' Write Markers, no coupon code required! •You must choose me, Angela Bodas as your demonstrator and subscribe for two months to qualify. After that you may cancel, or skip a month at any time. Each month I'll host a free Pumpkin Night where we can get together and make our monthly project. Look on Facebook for the next one! - I can even stream live, if you want to be my long distance craft buddy! Google Hangouts are pretty fun!! I'll share some of the great ideas for using your exclusive stamp sets on other fun projects, and when my grab bag arrives we will ENJOY THE FREEBIES!!! !